Hi, Thank you, friends and viewers. Today I will post how to make vegetable stock recipe. 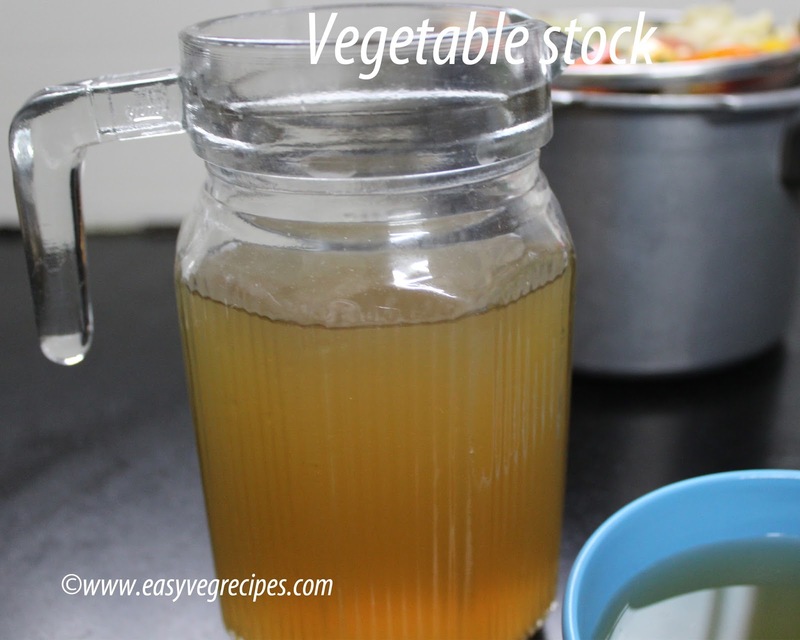 Vegetable broth or stock is made from boiling of vegetables in a thick bottomed pan. Once all the vegetables get cooks for half an hour to 45 minutes, drain them and extract water. This can be stored in refreigerator for 7 to 9 days. It is used in most of the Indo-Chinese recipes and also in soups. There is no specific measurements for this recipe, we can add as many vegetables as possible. But main important rule we have to remember is do not add strong flavoured or tasted vegetable. Wash and cut all the vegetables. Just make three or four pieces of each vegetable, no need to concentrate on the size and shape of them. In a thick bottomed vessel or kadai, add in the vegetables. Pour three to four cups of water or till the veggies immerse. Let this boil for thirty(30) minutes to forty five(45) minutes in medium to low medium flame. Do not cover the vessel and just give gentle mix ocassionally. Once cooled, collect the water by straining it into another vessel. Allow this to come to room temperature and store in an airtight container. This stock can be stored for 7 to 9 days, if refrigerated. Use it in soups, Indo-Chinese recipes.